– The Iowa Wild, in conjunction with Iowa Corn(r), announced on Thursday, the two have partnered to create Hockey Days Iowa – an outdoor three-on-three hockey tournament to be held from Jan. 13 – 14 in a central Iowa cornfield. 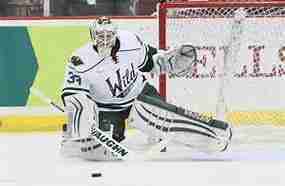 “We are proud to partner with the Iowa Wild. Sponsorships like this one will help us share with Iowans all of the amazing products made with corn and share our farm families’ stories with a broader audience”, said Iowa Corn President Duane Aistrope from Randolph, Iowa. “It’s important we as farmers connect with people where they are and find opportunities that encourage open conversations to build collaboration and trust. We are looking forward to Hockey Days Iowa because it will give us a chance to bring people to the farm to learn about agriculture. Anyone can sign up to participate in the tournament with an early-entry fee of $300 per team – which guarantees a minimum of three games. The package includes a jersey and two tickets to a future Iowa Wild home game. Food trucks and various beverage vendors will be on hand to serve refreshments and the tournament kicks off with live music on Saturday, Jan.13. The Iowa Wild continues to infuse hockey resources into the central Iowa. Since its inception in 2013, the club has started a reading program and floor hockey program in the local schools, outdoor community rinks (West Des Moines, Ankeny and Waukee), and a sled hockey league to begin play soon. During the 2016-17 season, the Iowa Wild generated over $357,000 in charitable donations. Iowa and San Antonio faceoff again on Friday, Nov. 3 at 7 p.m. at Wells Fargo Arena. It is a Bus beer night with $2 beers presented by 100.3 The Bus. The team is also holding a coat drive at the game. Fans receive a free weekday ticket voucher with a donation.